The Hearts of Gold LP from Grecian producer Nickos Dervisis, a.k.a. 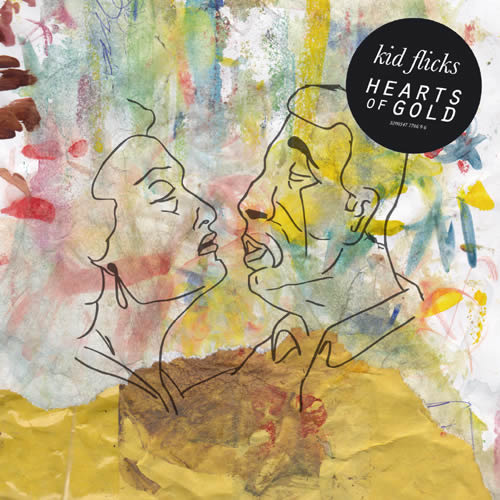 Kid Flicks, opens in a aggitated state of perpetual motion with “Anhkein”. It bares kinship to Panda Bear's Person Pitch, particularly the lengthier jams like “Bros” that settle into pleasing vingettes. The songs to follow adhere to pop structure, creating bridges and refrains, which suggests that Kid Flicks just had a lot to get off his chest before he could settle into Hearts Of Gold. Released in September on Inner Ear, the album's frenetic movement possibly stems from Dervisis himself. The album and the story of its creation should be a Macbook commercial. Dervisis took his Macbook to fields outside Preveza, recording songs in his car, while admiring the pastoral terrain. He spent evenings on beaches, recorded at sea and in the forest near his house in Lefkada. He mixed it in cafes, student dormitories in Munich and at the homes of his friends. Recorded in the span of 2008-2010, Hearts Of Gold is a vacationer's record running low on space for passport stamps.